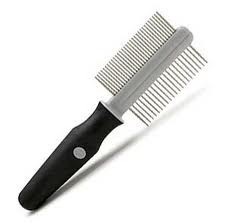 The Grip Soft Double Sided Comb has a coarse comb on one side to loosen dense matted fur and a fine comb on the other side to comb through hair to give a shiny silky tangle free finished coat. JW combs are specially designed with the teeth turned 90 degrees away from the skin to keep the teeth parallel to the skin while combing. This prevents "raking" the skin while combing and is more comfortable for your pet.